Home-Built 2700 HP Jet-Truck Is The Coolest Truck Ever! 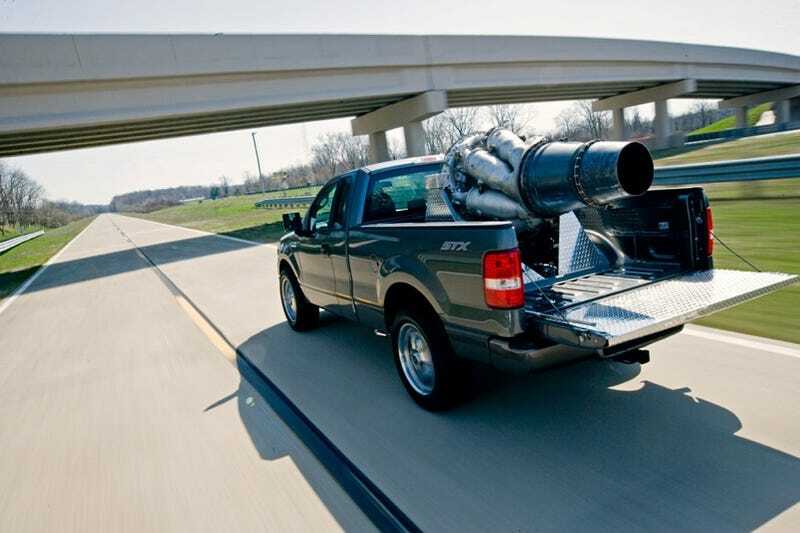 In a bid to give his 2005 Ford F-150 more power, Jackson, Michigan native Chris Lentz strapped a Czechoslovakian Motorlet M-701 turbojet to the truck bed, creating a 2700HP jet-powered truck. It's the coolest truck we've ever seen. Video below. The fifty-five-year-old electrical foreman from Jackson, Michigan, had longed for a jet-powered truck for decades. Two years ago, Lentz discovered a way to realize his dream when he met a pilot from New York who imported used turbojet engines. After watching an example run on a test stand, Lentz paid $10,000 for one. Obtaining a rolling platform for his new toy was a bit easier. Lentz bought a used 2005 Ford F-150 STX on eBay for $12,000. To install the jet in the truck, Lentz fabricated a sturdy mounting stand, a twenty-gallon kerosene tank, and a control console from aluminum and stainless steel. His decorative touches include a red, white, and blue nose cone and a 2700 HP badge (not divulged is the 516-mph velocity needed to achieve that power level). "Without jet assist, Lentz's 231-hp V-8 accelerated its 6600-pound burden (truck, jet engine, two occupants) to 60 mph in a sluggish 14.5 seconds. We recorded a quarter-mile speed of 73 mph and a top speed of 85 mph. The best of three runs in hybrid mode - exploiting both piston and jet propulsion - trimmed six seconds from the sprint to 60 mph. The quarter-mile speed jumped 30 mph and we achieved 140 mph after 45 seconds of acceleration." Whoa! That seems pretty slow to us. Maybe it's because of that whole 6600 lb thing. Meh, still pretty damn cool!